Urs König gave us an update on the status of the QDT QL desktop software from Jim Hunkins. “I followed the development of QDT very closely, from early alphas until release. Met Jim a few times in the US and Canada at and around QL shows (1995, 2002, 2004, 2006). See Shows folder in the Sinclair QL Picture Gallery (SQPG) either online or on THE DISTRIBUTION (folder THE_DISTRIBUTION\pic\Shows\…). BTW: One of my 1st videos on my YouTube channel is about QDT. Last commercial version of QDT was 1.02, released in 2006 (months before the Niagara Fall QL show). There is a notation of letters to identify the type of release (r=full, u=update, d=demo). Demo versions did not have the full functionality and were distributed through various channels (version 0.62d on the QL Today Cover Disk 14, Volume 9 Issue 4 , Nov/Dec 2004; version 1.00d online in January 2005). I approached Jim by email in December 2013 during my preparations for the “QL IS 30” activities (THE DISTRIBUTION, QL/E re-release, etc.) and asked him to release QDT as freeware or even public domain. On January 2nd 2014, after some back and forth where we also had Jochen in the loop, Jim agreed to declare QDT freeware and more importantly started to prepare an updated version 1.10r (Full release) based on version 1.02r. It started a back and forth development and test period where I’ve spent hours if not days testing QDT and reviewing the documentation until on February 7th 2014 the full package was ready for release, inclusion in THE DISTRIBUTION, re-distribution, and integration into QL/E. The full package of the latest QDT version 1.10r can be found on THE DISTRIBUTION (folder THE_DISTRIBUTION\xcl\qdt\). 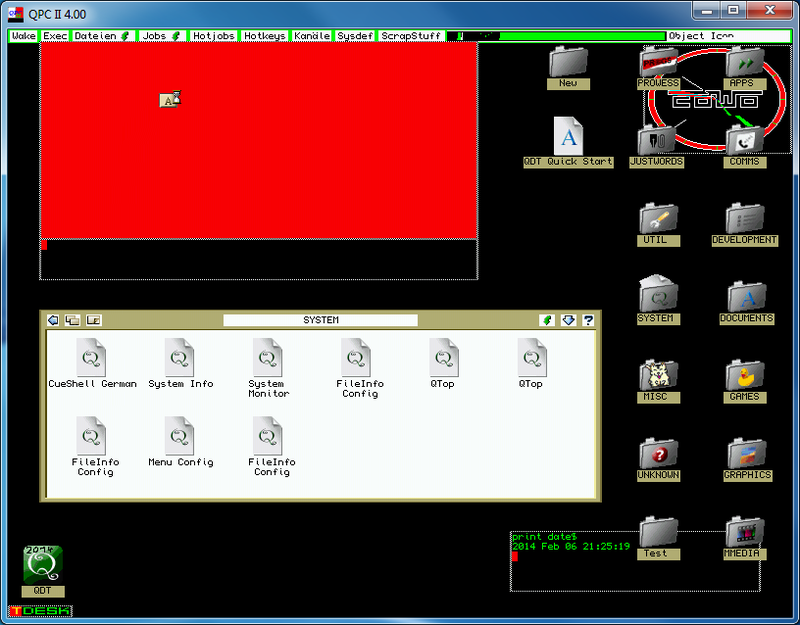 Or you can enjoy QDT installed and pre-configured on QL/E and Black Phoenix. I’m still in contact with Jim (yes, he replies to me), who is a very talented and dedicated engineer working at AMD. There might come something related to QDT in the (near) future. Please be patient and do not push. It is not helping to put pressure on him. This entry was posted in News and tagged QDT Desktop on 08/03/2017 by Dilwyn.